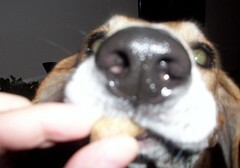 All noses love Mrs. Beasley's! ﻿﻿The newest treat from Mrs. Beasley's is here... K.C. 's Kelp Krunchies with organic VitaminSea pet kelp meal baked into every bite. The Lapdogs happily taste tested and gave their 16 Paws Up Lapdog Seal of Approval. The ingredients in K.C. 's Kelp Krunchies are pure and simple; rye flour, cheese, seaweed kelp powder, water, eggs and canola oil. The seaweed kelp powder, VitaminSea Pet, is harvested and manufactured in Buxton, Maine by VitaminSea Seaweed and is another wonderful product in and of itself. Kelp meal is a natural organic supplement providing many health benefits to both small and large animals. When used as a daily supplement, kelp is a rich source of micro-nutrients and trace elements. Benefits for dogs and other small animals include: healthier skin and coat, brighter eyes, higher resistance to infections, increased healing from injuries, better digestion, fewer parasistes, reduces stress, calmer temeraments, increases stamina, reduces pain from arthritis, reduces allergy symptoms, better reproductive performance and better growth rate. K.C. 's Kelp Krunchies are available in two different sizes, 3oz for $2.95 and 7oz for $5.95. They're not only a tasty treat for your 4-legged friend, but a beneficial treat as well. Are you anxious to add K.C. 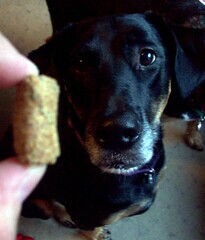 's Kelp Krunchies to your dog's diet? 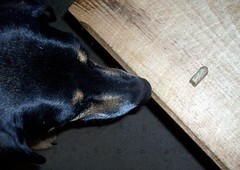 Perhaps you have a dog drooling by your side, longing to try them? Act Now! Order these or any other treats from Mrs. Beasley's website and receive 10% off of your entire order by entering the coupon code KCKELP during checkout. Seaweed does a dog good! 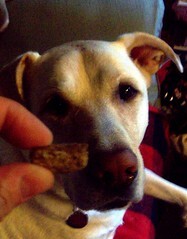 2) Leave a comment here telling me what vitamins or supplements you currently give to your dog(s). To get an extra entry, send your friends here to enter and be sure to have them mention your name.... blog, Tweet, Facebook and text away! Deadline for entires is Thursday, September 23 at midnight. Those treats look yummy! I give my babes calcium citrate, potassium chloride, brewer's yeast and glucosamine. It is mixed in their food that I make every weekend. Great Product, will not find a better treat for your pal. Since the puppies are seniors (don't tell them they think they're REAL puppies) I give them glucosamine and chondroitin. Mr. Bettis & Co don't do supplements. Vet checked and approved ;). Where do I start? Everyone takes fish oil daily and some take it twice daily. Some take glucosamine/chondroitin. Two take milk thistle and starting this week we're all (humans and canines) taking blueberry capsules. They also each get a Brazil nut once a week for selenium. Yummmy these look good! 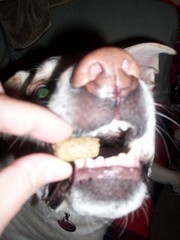 I use supplements for Haylie only - she has HD so she gets kelp, MSM and Glucosamine daily. They also both get fish oil once a week.